I find the prospect of Jordan running for House speaker of great interest. Ohio Republican Congressman Jim Jordan has confirmed that he is looking to run for House speaker when current Speaker Paul Ryan departs at the end of the year. This puts Jordan up alongside the other principal candidates, current Majority Leader Kevin McCarthy, R-Calif., whom Ryan has endorsed as his successor, and Majority Whip Steve Scalise, R-La. Jordan co-founded the House Freedom Caucus in 2015 with eight other conservative Republicans. He explained then that the motivation for founding the caucus was to give "a voice to countless Americans who feel that Washington does not represent them. We support open, accountable and limited government, the Constitution, and the rule of law and policies that promote liberty, safety, and prosperity for all Americans." The caucus now has more than 30 members and has dug in as a unified bloc fighting for exactly those principles that Jordan articulated at its founding. Most recently, the caucus opposed the $1.3 trillion spending bill passed by congress and urged President Trump to veto it. In addition to being a fiscal and constitutional conservative, Jordan is also a stalwart pro-life Republican and has been on the front lines fighting to defund Planned Parenthood. In other words, he stands for what I call the three C's that have been the pillars of American success and greatness. Christianity, Capitalism and the Constitution. For this reason, I find the prospect of Jordan running for House speaker of great interest. In a recent Fox radio interview, Jordan put it best by saying that in order to win, Republicans "have to fight for things. All too often Republicans want to forfeit even before the referee blows the whistle to start the game. ... Let's not forfeit, let's go have the debate." But it's not just a matter of the fight. It's what the fight is about. 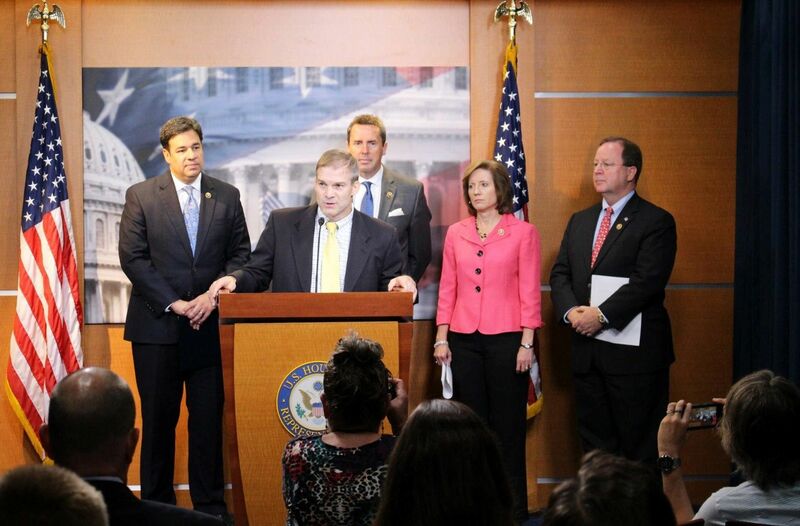 Certainly, in 2015, when the House Freedom Caucus was formed, few would have predicted that Donald Trump would be sitting in the White House today. Trump's appeal to make America great again spoke to the frustration among many Americans that we've lost touch with our American "exceptionalism." This is the sense that we are not like other nations — that something special and vitally important is going on here. And that this "something" is what has given the nation strength, prosperity and leadership. Unlike other nations, American identity is about aspiration, not fate. Geography, ethnicity or circumstances of birth do not define America — ideals and principles do. These ideals define the struggle that is taking place today. Many want to drag us down to the lowest common denominator when we should be fighting for our highest aspirations. As we teeter on fiscal and moral bankruptcy, it's the three C's — Christianity, Capitalism and the Constitution — that shine like a lighthouse in the night to guide our ship of state in the direction we need to be headed. Those who founded the nation, fired up by those ideals, appealed, in the Declaration of Independence, to the "Supreme Judge of the world for the rectitude of our intentions (and) with a firm reliance on the protection of Divine Providence, we mutually pledge to each other our Lives, our Fortunes, and our sacred Honor." Of course, Jim Jordan faces an uphill struggle to achieve the 218 votes necessary to achieve the House speakership. But when Jordan says he's ready to fight for it, and that we shouldn't forfeit the game before it starts, he's not just tapping into the dissatisfaction of the nation. He's tapping into what defines the nation and its spirit. The possibility of bringing the spirit of the Freedom Caucus to lead the House, as Jordan will do, is an exciting development.